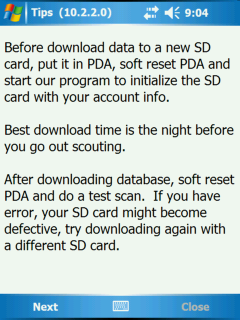 The Tips screen shows useful tips and tricks for getting the most out of the PDA software. It is set to come up automatically on start-up, and can also be accessed through the Select menu. 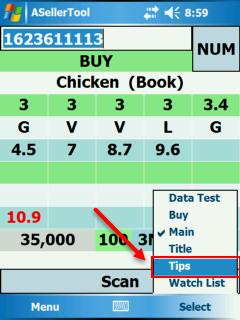 The Tips screen will display the version number of the PDA program at the very top, next to ‘Tips’. There are some interesting tips on both screens listed here. 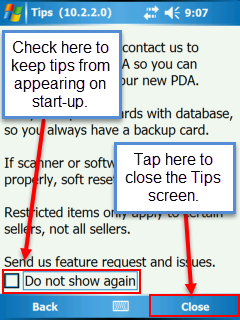 Clicking Next on the first screen will bring you to the second, where you can both close the Tips screen, and ensure that the screen does not appear on Start-up if you do not wish it to.